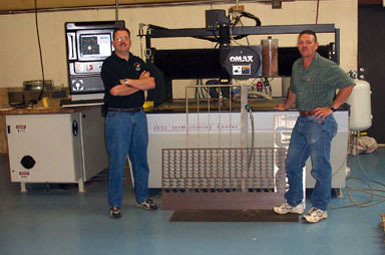 Abrasive waterjets are used to profitably machine virtually any material. Designed to complement or replace existing processes such as milling. With speeds of 200 inches per minute standard (5080 mm/min) (speed can be increased if desired) this adds another element to our quality on-time projects. The basic technology is both simple and complex. When water is pressurized up to 60,000 pounds (or more) per square inch (psi) and forced through a tiny opening, it can cut a variety of soft materials including food, paper and baby diapers, rubber and foam. When small amounts of abrasive particles, such as garnet, are mixed into the jet stream, the resulting “abrasive waterjet” can cut virtually any hard material such as metal, composites, stone and glass. When we started C & C Tool and Machine, Inc. our first goal was to establish a reputable machine shop that provided quality work and timely service. Today, we are proud to say that we have accomplished our initial task and are continuing to expand. For the past several years our company has steadily grown in size including our employees, our machinery and our facilities. These additions have allowed us the opportunity to seek new clients. Please take the time to continue reading this letter and to review the other information in this website. C & C Tool is located in Monroe, North Carolina. Our key employees have more than 100 years experience in the business including experience in the products and services listed throughout this website. Our company’s success in the business is not based on experience alone, but is also attributed to the pride that we take in producing top quality work. Our client base today is an all-repeat customer base that understands the value of our quality work and timely deliveries. We would like to invite you to be a part of this. We are currently seeking new jobs for our new water jet, JetMachining Center, CNC Milling and CNC Turning and will be glad to discuss other jobs in which we have experience. Make sure to see our Facilities & Equipment link and review the equipment that we have. I welcome the opportunity to speak with you about your particular needs. Our goal is to work with you in a timely and professional manner and to help your company by meeting its needs with quality work.